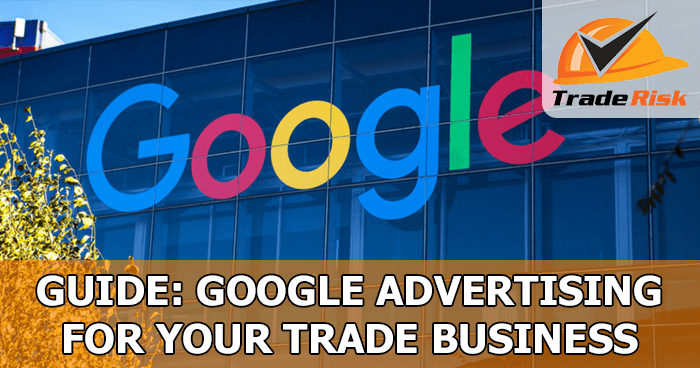 Could Google Ads help your trade business to get more business? You might be thinking “Trade Risk is an insurance broker, why are you talking to me about online advertising”? Well as a business that has spent well over $100k on Google Ads over the last few years, we do know a thing or two about making it work! Furthermore, we do everything in-house, so we’ve built up a lot of knowledge and experience when it comes to Google Ads. So we’ve decided to put together this guide for tradies considering using Google Ads, based on our experience over the last few years. If we can help you to grow your trade business with a little free advice, it’s a win-win for everyone. Up until recently it was known as Google Adwords, but since 2018 it’s simply been called Google Ads. Whenever you search in Google, you’ll see those four listings at the top of the results with a little green “Ad” box next to the website address. These listings aren’t there because Google thinks they are the best results. No, they’re there because the business paid the most amount of money! Well that isn’t 100% accurate, but we’ll go deeper into that later. Broadly speaking however, the top four will be ranked roughly in order of how much they’re paying to Google. Below the four paid results are the “organic” results. By organic, we mean the results which are there on merit rather than spend. Of course we’d all rather rank at the top for the organic results, so we’re not paying for every click, but sometimes it’s the only way to get up there. Google Ads will 100% get you new clients. That’s certainly been our experience over the years. However just because it does get you clients doesn’t mean it will stack up for your business. One of the most important metrics to look at is your Cost Per Acquisition (CPA). What is your CPA? It’s the amount of money you spend on ads for each new client that is acquired. In terms of a formula, it is your total ad spend divided by the number of new clients generated. So if you spent $500 for the week and acquired five new clients from it, your CPA would be $100. Then you need to ask yourself if that works for your business. If your profit on each new client is $2,000 then it’s probably safe to say it’s working for you! But if your profit is only $75 per client then clearly it’s not going to make sense for you. So yes it will get clients for your trade business, but will it get you clients at a price that stacks up? That’s the important question. Google Ads works on a bidding system. So you set the amount you’re willing to pay for a click for a particular search term, and Google will rank you along with your competitors based on your bids. Let’s say you’re an electrician in Sydney and want to attract users who are searching Google for “Electrician Sydney”. Using the Keyword Planner tool in Google Ads we can see that the average Cost Per Click (CPC) for the term ‘Electrician Sydney’ is $8.33. That’s the average CPC, so if you wanted to be at the top of the list you’d have to bid more, or if you were happy to be a little lower you might be able to bid a little less. Along with setting your CPC bid, you also set your daily budget. This won’t affect where you ad ranks, but will affect how many times it can be clicked on per day. For example if you set your CPC bid at $8.00 and your daily budget at $80, you could expect to get around ten clicks per day. If you want more clicks (and therefore more traffic) you would simply increase your daily budget. Google gives you a huge amount of flexibility here. If you just want to dip you toe in the water, you could literally set your budget at $10 a day, knowing that you’re not going to be blowing the bank. Or you could set your budget at $10,000 per day and really open the floodgates! Of course that’s no good unless you have the resources to service such a huge level of enquiry. This is one of the most important parts in getting Google Ads to work for your trade business, and can have a huge impact on your Cost Per Acquisition (CPA). So you might think that the keyword ‘Electrician Sydney’ is the way to go with an average CPC of $8.48. But you live in North Ryde, so you also look at ‘Electrician North Ryde’ and see the CPA is $9.28. You might be thinking, why is a click for a single suburb higher than a click for a massive city like Sydney? Some people (hopefully your competitors!) could look at that and not use the ‘Electrician North Ryde’ keyword. After all, why pay more for that keywork which is so much more limited? You need to think beyond the CPC and consider the likelihood of converting that click into a client. So your ‘Sydney Electrician’ click might be from someone in Hurstville. They’ll click your ad and go through to your site, but once they’re on your website and see your address an hour away, they might not even bother contacting you. That’s $8.48 wasted. But someone searching for ‘Electrician North Ryde’ is most likely in North Ryde, and once they get to your website and see that you’re located in the same suburb they are far more likely to convert into a client. So you might have paid a dollar more for the click, but the click is twice as likely to convert into a lead and hopefully a client. And that has a massive effect on your Cost Per Acquisition (CPA). You might need 20 clicks on your ‘Electrician Sydney’ ad to secure a client, but only 9 clicks on your ‘Electrician North Ryde’ ad to secure a client. So your CPA for the North Ryde keyword is winning you clients for less than half the price of the Sydney keyword! It’s pretty obvious which one you should be focusing on. With Google Ads you have a massive amount of control over when your ads are shown. At the most basic level, you can simply turn them on and off as you choose. If you find yourself super busy one week, you might want to switch your ads off for a while. If you’re finding yourself a little low on work, you might want to crank the budget right up. You can also use automation to set the days and times that your ads show. For example if you choose not to work weekends, you can set your ads to only show on weekdays. The time of day can also be a very powerful setting depending on the type of business you operate. A great example if after hours electricians and plumbers. Someone searching for “after hours plumber” at 1:30 in the afternoon might be a little questionable in terms of what they’re really searching for. But someone searching for the same term at 1:30 in the morning is quite clearly after a plumber right now! So you can set your keywords relating to “after hours” or “emergency” to only show at certain times. For example you might want them to show between 5pm and 5am. Or you might prefer an earlier night, so you run them from 5pm to 11pm. There is so much power to run each of your different ads at precisely the right time so you’re getting the maximum benefit for your budget. Is it starting to make some sense? Or still confusing as? Don’t worry if it still seems a bit overwhelming. Getting started is super easy, and you can make it more and more complex as you go. This article has barely scratched the surface in terms of what we know about Google Ads. There is so much more to learn! As we mentioned earlier, we’ve spent well over six-figures on Google Ads over the last couple of years. We do everything in-house and have built up some great knowledge and experience. If we can help some of our Trade Risk clients by sharing that knowledge, why not? Please let us know if this has helped at all, and if you’d like more similar content. We’re happy to write it if there is demand from our clients.